Adblock Plus is the most popular content blocking add-on for the Mozilla Firefox web browser. 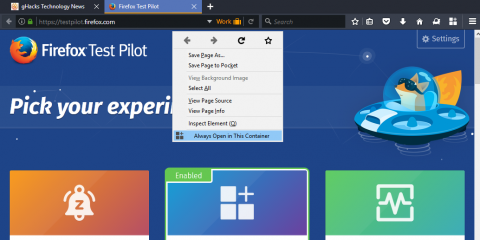 In fact, it is the most popular add-on for Firefox by a large margin. Its more than 14 million users beat second placed uBlock Origin by more than 10 million users right now. But things are not super great if you take a look at how Adblock Plus’ user count developed over the past year. 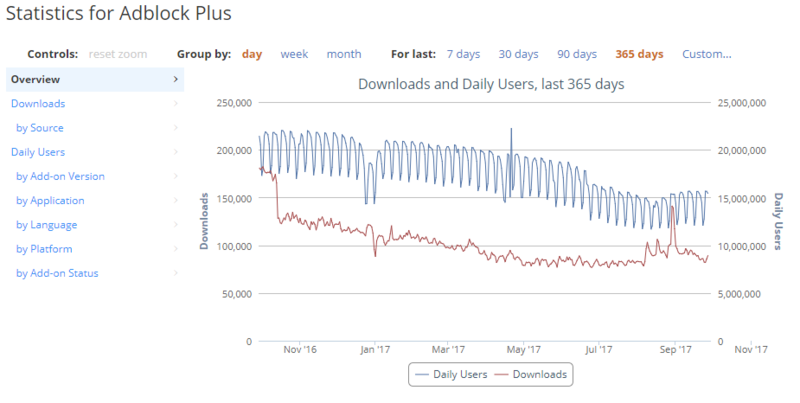 A quick check reveals that the add-ons daily average user count and daily downloads are down. An average of 21.4 million users used Adblock Plus daily on September 29th, 2016. Additionally, the add-on was downloaded 181,000 times on that day alone. One year later, daily users are at 15.4 million on September 27th, 2017, and daily downloads at 89,000. That is a decrease of about six million users in a year’s time, and a drop in daily downloads by 92,000 when compared to the stats a year ago. One could argue that Firefox usage may be down as well, and that the drop in daily users and downloads is caused by that more than anything else. But this would mean that other add-ons should see similar drops in usage. If you take a look at the uBlock Origin statistics, the second most popular add-on on Mozilla AMO right now, and a content blocker as well, you will notice that the add-ons stats are up. On September 29th, 2016, uBlock Origin had about 1.5 million daily users, and about 22,000 daily downloads. One year later, on September 27th, 2017, those figures rose to 4.1 million daily users and 55,000 daily downloads. The add-on managed to more than double its user base and daily downloads in a year’s time. To be fair, uBlock Origin’s daily downloads jumped shortly after September 29th, and have actually dropped heavily at the end of June and recovered only recently. The huge uptick of downloads at the end of August seems to correlate with the release of the WebExtensions versions of uBlock Origin. Similarly, Adblock Plus managed to increase its daily downloads at around the same time, but both download counts did fall to previous levels shortly thereafter. To come back to the initial question: why did Adblock Plus’s daily user number drop by several million users while similar extensions did not see a drop but an increase instead? Adblock Plus’s Acceptable Ads program might be a reason. 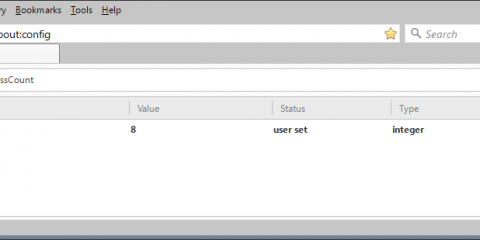 While it is possible to disable the program in Adblock Plus, some users may have had troubles doing so, or made the decision to move to another content blocker instead. Rise in popularity of uBlock Origin which may have had an impact on Adblock Plus’s performance. Interest in Adblock Plus dropped slightly according to Google Trends, but uBlock Origin interest increased only slightly however. It is likely that uBlock Origin gained users who migrated from Adblock Plus to the new extension, but this does not explain what the remaining millions of users did. Could it be a change in reporting on Mozilla AMO? Now You: What is your take on this development? 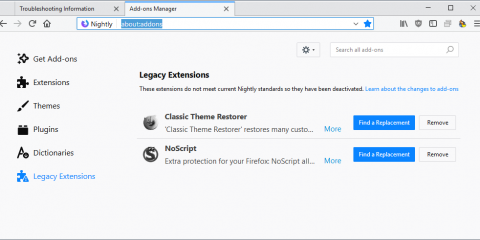 The post Firefox: Adblock Plus lost millions of users in the past year appeared first on gHacks Technology News.